The Supreme People's Court pledged to strictly punish people who fail to comply with verdicts and who oppose the enforcement of rulings, to protect the rights of lawsuit winners and strengthen China's rule of law. The top court made the promise in a report about the work of Chinese courts on Wednesday to the Standing Committee of the National People's Congress, the country's top legislature. The NPC Standing Committee will review the courts' performance. The report said the top court has taken various steps against defaulters in recent years, including increasing criminal punishments for those who are able to comply with court-mandated penalties but refuse, as well as people who illegally hide assets and then claim inability to pay. Since the beginning of this year, for example, 7,281 people have been criminally punished for flouting court rulings, up 90.6 percent year-on-year, it added. 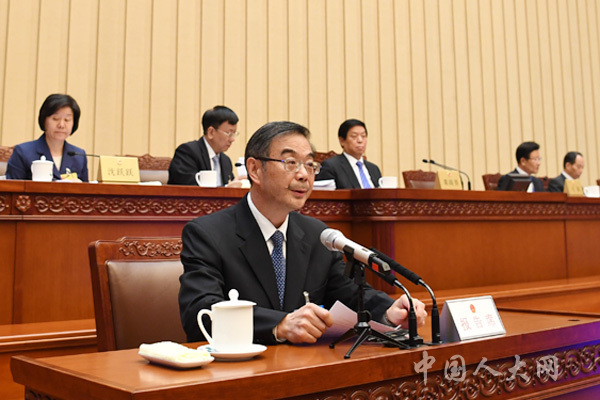 "Every court must fight defaulters with zero tolerance, which is not only to safeguard the rights of people who win lawsuits but also to build a more fair legal environment for all of us," said Zhou Qiang, president of the top court, who explained the report on Wednesday. He ordered all judges to abide by 37 judicial interpretations and guidelines issued by the top court since 2016 to improve verdict enforcement while avoiding judicial mistakes and disorder. To get people to comply with verdicts against them, the top court established a blacklist online in late 2013 to disclose information on defaulters. By the end of September, details on more than 12 million violations of court orders have been posted on the blacklist, the report said. As the difficulty of pushing people to implement rulings often surfaces in public complaints, the top court has coordinated with other authorities to solve the problem since 2016 by restricting defaulters' daily lives. For example, a blacklisted defaulter is prohibited from buying flight and high-speed rail tickets and cannot serve as a company executive. As of September, 14.63 million airplane trips and 5.22 rail trips have been blocked, the report said, adding that 3.22 million defaulters have complied with court orders because of the inconvenience after being placed on the blacklist. To increase the efficiency of verdict enforcement, the top court set up an online platform with banks and financial departments to search the property ownership records of defaulters. To date, more than 3,900 such institutions have connected to the platform, and the courts can search for 16 kinds of assets, including defaulters' savings accounts, securities holdings and real estate, it said. "But the current search steps need to be simplified and upgraded," Zhou said, suggesting courts apply artificial intelligence and cloud computing to speed things up. "We welcome public supervision, such as from lawyers and litigants. What we want is to build a credible society," he said.